Friend of mine dropped an idea on me I wanted to see if there was any interest in. If I set up a Selkie Discord server, would anyone be up for using it to chat? Avery isn't above some dominance-assertion laps. 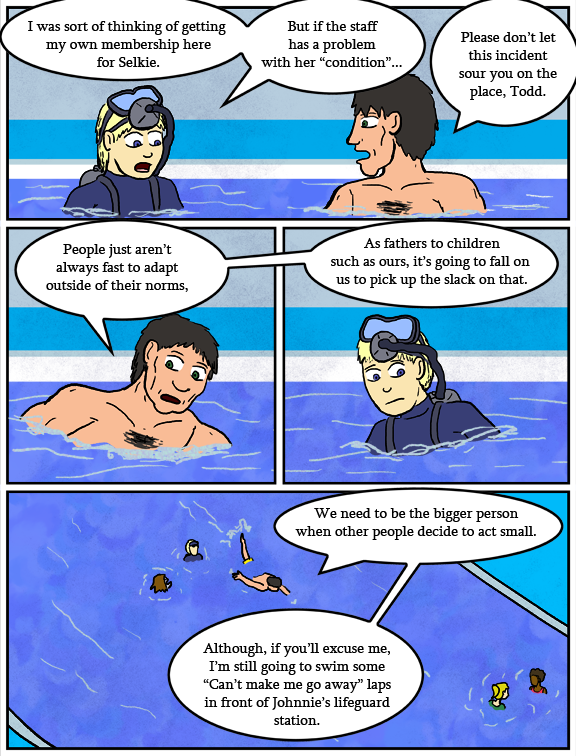 So agent Brown and Selkie’s family both tell people that it’s a skin condition, is there any people in the know who actually go around saying “hey this guys are totes from an underwater civilization, that’s why they look like that” I wonder if anyone would take them seriously, or what they would think. The bigger person thing doesn’t always work though and can lead to a few problems. But I guess it could work here. Always a good first step. Spitting in his face is always an alternative for later. …and after that, having SELKIE spit in his face. It’s kind of understandable. If you tell folks someone is sick of course the first reaction will be “can i catch it too?”. Wonder why they don’t just reveal the truth to the public. 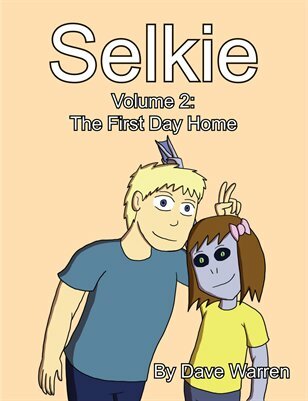 As agent Smith put it previously, some humans have trouble accepting other humans with a 30% melanin difference, how do you think they’ll take Selkie’s people? I know they’re trying to slowly integrate the Sarnothy into human society, but I feel that even after people get used to people with Selkie’s “skin condition”, there will still be hate groups forming up. And some people have trouble accepting gays or or lesbians. Plus sarnothi look visibly different so they can’t pass for normal anyway and would be discriminated based on that alone. Dunno, I don’t think its really helping plus will make things more difficult if the truth does come out. Also, when people acted badly – one small group could poison their whole eco-system “in protection” of the land-dwellers. Considering that the US had eugenics against those that are “abnormal” until the 1970s, it’s not to far of a leap that this would happen and all sarothi would be dead. I think also because the war started over whether sarnoth should reveal its existence to the surface. Forcing their hand on the matter might make things MUCH worse, esp. Given the pro-reveal factions desire for vengeance on all mankind. Even ignoring the hate issues, there’s another big factor. Sarnothi Tech is probably a major factor in that decision. Reveal them and you either force them to hide a major part of their culture or you reveal a tech that is borderline magic. Now suppose a government found out about Selkie’s bow, imagine how much they’d pay to be able to do a deaddrop of something that innocuous to communicate with spies. more importantly what would they do to a civilization that had that tech and wouldn’t sell it to them? That’s not even counting the tech we don’t see. It’s just the nastiest can of worms right now. Yea and all of those things will need to be adressed eventually anyway, but now there will also be a “we have been lied to” outrage in top of that. SELKIE DISCORD APP??? YES, PLEASE. I’ve used discord.. id be interested. A few of my other webcomics also use it. Make sure you have mods. Sure. Why not? It could be interesting. Discord, yeah I would check it out. Ahahhaaha ‘Can’t make me go away’ laps. I love that. Sadly, being deaf, chat only works for me if it’s text. But cool idea! Is there an IRC gateway? Loved your comic so far and continue to love it. Have to ask, this guy, as masculine as he is, and with the history he hasm will there be… unsavory results from other children like Selkie? I’m a bit unclear on the specifics of your question, but I don’t forsee him becoming an Unsavory Avery. The Unsavory Avery goes to the Aviary then the Bakery. Mmm. those are one of my favorite type of laps. For the security consciousness of your fans, I’d strongly recommend against Discord, and look toward something safer like Teamspeak. The “free” should be the first tip-off that Discord’s unsafe. The developers of Discord have a history of creating datamining software, and then selling it off to larger corporations (take a look at their track record). Most of their ventures have been in the mobile market. Considering Discord is designed to “sync” with all manner of private accounts on other services as a “feature” smacks of more datamining. There’s no such thing as a free server, and Discord Inc makes the money to keep their “free” servers online somewhere. show your support so we can has a discord channel! What the heck is a Discord Channel?